Tobacco giant Altria (manufacturer of Marlboro) has agreed a deal to purchase Florida-based e-cig company Green Smoke, marking another milestone for the Big Tobacco expansion into the e-cig industry. Following in the footsteps of Lorillard, who purchased blu eCigs in 2012 and UK-based SkyCig a year later, the manufacturer has snapped up one of the leading cig-a-like e-cigarette brand for the sum of $110 million. The move comes while Altria’s work-in-progress self-made e-cig MarkTen is being trialed in Arizona and Indiana, and potentially represents an acknowledgement that established independent e-cig companies are a safer investment for a tobacco company. What this will mean for Green Smoke and whether other tobacco giants will make similar purchases in future remains to be seen. Altria – as the dominant tobacco company in the U.S. – has long been expected to make a move into the e-cig market, but the progress has been extremely slow. After sitting back and observing the industry for a while, the group began work on their e-cigarette, MarkTen, which launched in August last year in Indiana. The e-cig has had what’s been described as a “tepid” reception, and given that it’s a primarily disposable brand (unless you purchase a charger and replacement cartridges separately) produced in China, it’s understandable that it hasn’t made too big an impact in the booming, largely independent industry. Spokesmen for Altria, however, have said that they’re “pleased” with the initial reception for their own e-cig. Green Smoke, on the other hand, has been pretty successful. After first getting started in 2008 and starting selling online in 2009 (out of a garage), and have since gained a bigger and bigger share of the market. 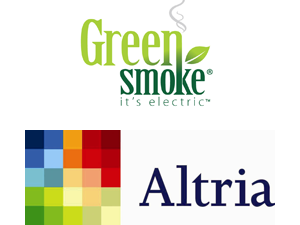 According to Altria, Green Smoke made $40 million in revenue last year. In contrast, Altria took around $24.5 billion over the same period. Although other brands like blu and Njoy dominate the convenience store market, Green Smoke still seems like a sensible investment, especially as the $110 million is mere chump-change in comparison to Altria’s annual revenue. For Green Smoke, it’s also a fairly sweet deal. The sum is almost three times the last year’s revenue for the company, and the deal includes up to $20 million in incentive payments for the executives, who will be kept on after the deal goes through. From Altria’s perspective, the already-successful company seems like a safe bet, especially when it has the benefit of the tobacco giant’s established retail distribution network. The acquisition is expected to be finalized in the second quarter of 2014, and it will work with Philip Morris International (their non-U.S. Marlboro distributor) to sell their products internationally. Is the Tobacco Industry Grabbing a Life-Raft in the Form of E-Cigs? There is a lot of speculation as to whether moves like this are a result of the shrinking sales for tobacco occurring alongside the boom in e-cigarette purchases. Altria chief executive Martin Barrington said that the impact of e-cigarettes on the tobacco industry has been modest, although last year marked an estimated 4 percent reduction in tobacco sales compared to the previous year, and is part of a continuing trend. It’s been predicted that sales of e-cigs will overtake those of tobacco cigarettes within the next decade. Barrington also said he was unconcerned about Altria’s relatively late entry into the e-cig market, claiming it is “early days” in the industry, and points out that its future very much depends on the implications of the coming FDA regulation. Of course, it’s also true that tobacco companies – well-experienced in complying with regulations and with formidable financial backing – are better set up to weather the coming changes than e-cig companies, so this could explain the lack of concern about their late entry into the industry. On the positive side, Altria has written a letter to FDA Commissioner Margaret Hamburg calling for a lighter regulatory touch to be applied to e-cigs than is used for tobacco. Even though this is unlikely to make much of a difference to whatever decision the FDA has up its sleeve, the letter at least shows that they are acting in the interest of vapers on the whole rather than merely trying to corner the market. It’s impossible to deny, though, that if things go badly with the FDA, regulation could effectively decimate the competition and leave tobacco companies to reign supreme. The relationship between e-cigs and Big Tobacco is a complicated one, since they’re technically industries competing with each other for the same nicotine-consuming market. However, the three U.S. tobacco giants, RJ Reynolds, Lorillard and now Altria, as well as British American Tobacco and Imperial Tobacco, have now made a move into e-cigs, evidently recognizing a relevant and promising investment opportunity when it arises. RJ Reynolds has opted to manufacture their own e-cig rather than snap up an affordable, pre-established brand. Under the subsidiary RJ Reynolds Vapor, their brand Vuse aims to offer a technologically-advanced e-cig with a microprocessor dedicated to ensuring consistent vapor production and nicotine delivery (which has the potential to be a requirement of the coming regulations). This is accompanied by some additional changes like snap-on connections and encrypted cartridges (to ensure only official refill carts can be used with the battery) to add to the impression of technological advancement. The product is still only available in the trail area of Denver, Colorado, however, and there are only two starter kits, as well as tobacco or menthol cartridge flavors. Lorillard were the first tobacco company to make a foray into the e-cig market, acquiring blu electronic cigarettes in April 2012 for $135 million. The independent Charlotte-based company already had a retail distribution, and was purchased after securing $30 million in sales over the previous year. The following year, Lorillard struck a deal for UK-based brand SkyCig, in a deal for $50 million up-front with a maximum additional payment of $50 million depending on their financial performance up until 2016. They’ve undoubtedly been the most eager to get involved with e-cigs out of tobacco companies, and their general approach appears successful, with blu still maintaining the largest share of retail store e-cig sales. Their general approach appears to be to leave the companies running as before with some additional oversight; effectively not messing around too much with the already successful businesses. British American Tobacco has opted to create their own e-cig, making the announcement in late July 2013 ahead of a product launch in September. The e-liquid is made in the UK, serving as an assurance of quality to vapers, and is available in a disposable model as well as a rechargeable option. As with many tobacco company products, it appears geared toward smokers just making the switch, with a cigarette-like appearance and only tobacco and menthol flavors available. Imperial Tobacco isn’t rushing into investments like Lorillard or Altria, instead focusing on its own product due to hit the shelves at some point this year. The group has purchased intellectual property from Chinese e-cig company Dragonite, and chief executive Alison Cooper commented that “We have been working on this for a long time; we just want to get it right.” They’re clearly trying to put something impressive together, but whether it will live up to expectations remains to be seen. Conclusion – The Future of Vaping? Tobacco companies are likely to play an increasingly prominent role in the e-cig industry. From the initial years dominated by the start-up companies like Green Smoke, the cig-a-like beginner-level market is looking set to be the stomping ground of Big Tobacco. However, there is a general trend for those buying existing companies to keep the operations very much the same, allowing the new assets to flourish as they did pre-acquisition. Unless the companies opting to produce their own e-cigs do a fantastic job, this seems like a winning strategy because it will maintain the existing quality of the products for vapers. The only problem is that where independent, small businesses were once flourishing thanks to the new industry, it’s increasingly becoming just another profit-pie for monolithic tobacco giants to dip their fingers into. If this trend continues, the only downside is that we’ll still be lining the pockets of the people who peddled the deadly product we were trying to kick in the first place.